I started drawing by doodling just for myself. It’s fun. Slowly I dared to doodle with colleagues while having meetings. The power of clarifying things visually makes me drawing more and more. In this blog post I share some ideas on how to get started. A colleague had to facilitate a mid-term review meeting. She wanted some advice from me. Her programme was well designed and flowing. I only planted the seed to make the discussion more visual. 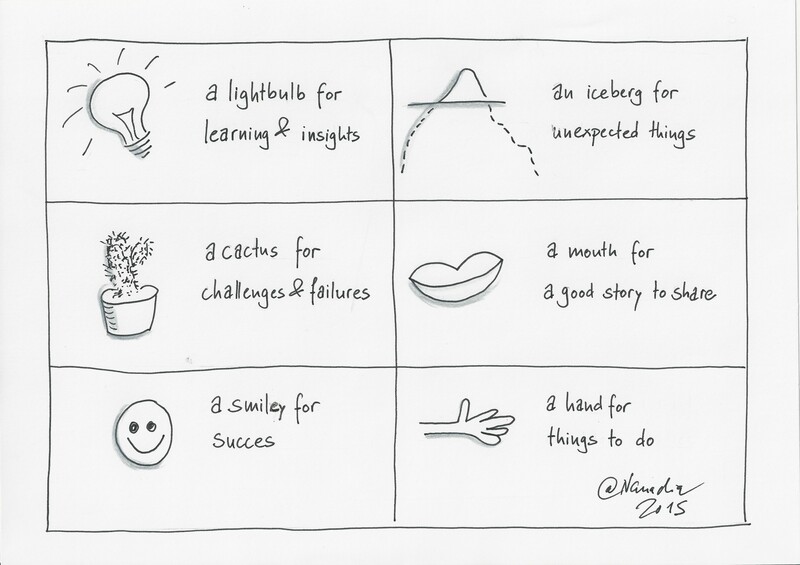 Why do you not invite people to draw some easy icons to visualize their progress? Easy icons for mid-term reviews. Ideas are endless. How did you make this light bulb? was her first reaction. Watch Jeffery Frankenhauser making drawings on the Xplane blog. It is fabulously easy! I started drawing by doodling. First just for myself, while taking notes or as side marks while reading. Then I went a step further and started doodling with colleagues. Doodling in meetings is great, especially in small settings of team meetings or while counseling/ advising colleagues. I often put a blank sheet of paper in the middle of the meeting table. Drawings help to focus the discussion. Making drawings clarifies joint understanding. And doodling openly often encourages colleagues to doodle too. …use colors or symbols (smileys, traffic lights, storm clouds) to highlight the points which you would like to have in the center of the conversation or the meeting. I google a lot to find inspiration for easy drawings. Add one of the following search words to your Google search: ‘drawing’ or ‘cartoon’ or ‘how to draw’ or ‘icon’. I bought some books on how to draw. Especially visual wordbooks, the ones graphic recorder rely on, are great because the drawings are simple. I love Bikablo. My favourite is gapingvoid. His ‘simple’ drawings are worth a thousand words. For learning to draw ny any cartoon is good, especially the simple ones for kids. It’s always good to have a sort of basic vocabulary ready. This is an idea from Nancy White; she is collecting images. Sketch Jam to develop and share your drawing skills. Making an input soon? Make it visual, respect the time, and inspire!